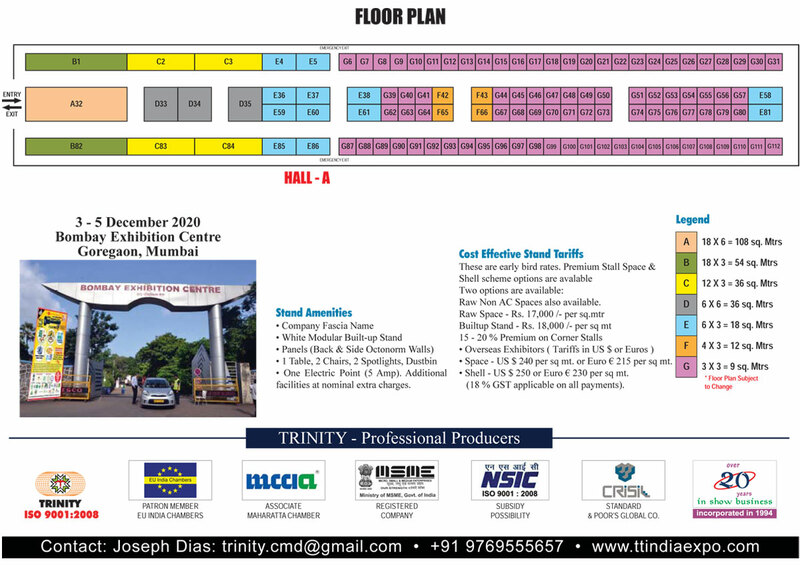 Trinity with over 20 years in the specialized industry business events in India & foreign countries seems to be the only producers of quality international expos & conclaves. We are here with our most ambitious yet - the 4th annual exclusive showcase for the Travel & Tourism sector. Nobody knows Western India ( Goa, Gujarat & Maharashtr better than Trinity does. We are putting in our best to give Asia one of its finest Travel & Tourism industry event etc. For which we have subsidies to give you value for money & cost-effective rates. 97% Exhibitors said they will exhibit again at TT India. 95% Exhibitors were extremely satisfied with the exhibition. 86% were happy with visitor quality & traffic. 77% said that they were able to achieve their business goals of contacting business partners. 74% exhibitors said that the fair help them to collect effective market information. 67% exhibitors felt that TT India Expo helped them to build their brand. Trinity has over 20 years recognized individual stalwarts and companies from various sectors related to different verticals in the travel & tourism industry. For instance, in 2018, the Mauritius Tourism Minister & the State Government Tourism Boards of Andhra Pradesh, Rajasthan & Tamil Nadu were awarded in the Platinum, Gold, Silver and Bronze categories. The excellence, successes and innovations of other stakeholders is also celebrated at a gala networking cocktails-dinner covering a range of segments including foreign tourism authorities, travel agencies, tour operators, cruise liners, destinations, Airlines, DMCs, OTAs, etc. Business Visitors - Who will attend? Hotels, Cruise Management, Restaurants, Super Markets, etc. Thousands of key decision-makers from among National / State Government Tourism Departments, National / Regional Tourist Organizations, Destination Management Companies, Convention and Visitors Bureaus, Amusement / Themes Parks, Railways, Airport Authorities, Air Charter Companies, Airlines – Domestic and International, Car Rental Companies, Convention Centers, Cruise Liners, Educational Institutes, Golf Courses & Resorts, Hotels & Resorts, IT Companies, Medical Tourism, Spas and Wellness Centers, Sports Tourism Products, International Tourism Organizations, Travel Agents, Tour Operators from the industry globally. It is thus an opportunity for building connections within the industry and reaching out to enhance your business. Logo where-ever possible on promotional material like badges, directory, etc. India’s Travel & Tourism industry is the 7th largest in the world, contributing nearly 9.6% to India’s GDP and estimated to grow by 6.9% p.a. in the next ten years, to become the fourth largest globally. This will create a multiplier impact on India’s socio-economic growth through infrastructure development, job creation and skill development, amongst others. *GST at 18% is applicable on all payments paid to Trinity.